We are in the home stretch! Focus on Project Three. Remember that you need to develop a cohesive unit plan that is based on the activities you created in Project One. Project #2, your unit plan, is due tonight. Please submit it in the Sakai assignment dropbox. Students can copy and paste text from websites and create a word cloud that can then be printed out or viewed on a tablet to refer to as notes for a report. This makes it impossible for plagiarism to occur because there are no sentences. The word clouds simply include words that will trigger students' memories and give them ideas to write about the topic they've been studying. 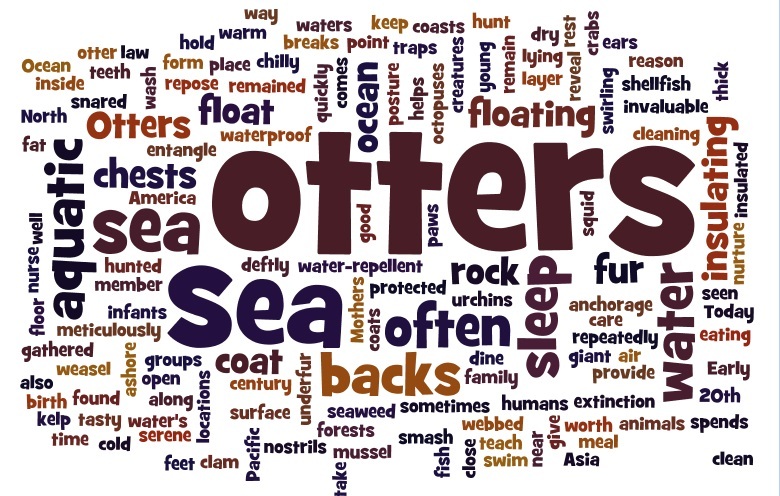 Sea Otter Report - Text copied and pasted from National Geographic Animals and turned into a Wordle. Example: Different versions of Cinderella from different countries or cultures. Copy and paste the plot of synopsis from each culture’s version and then compare and contrast the two versions by examining the word cloud. Paste your own essay into Wordle, create the word cloud, and you will see which words you are using a lot (the biggest ones). You can easily tell what the main idea of a passage is by looking at the word cloud. What emerging technology resources could you use in your unit plan? Think mobile technology – apps!